I love to bake in the morning. I find it tremendously satisfying to have something warm from the oven with my morning coffee, and getting dough under my nails before 8 am often seems to improve the quality of my day. Of course, I can usually only manage this on lazy weekend mornings, so that might have something to do with it, but I’m sure most of the magic is in the butter. I’m the kind of person who will get up and make coffee cake, content to wait a couple of hours for a really good breakfast, but for those of you without that kind of time — if you wake up starving or are intrepid enough to cook before heading to the office — there is an answer: scones. The beauty of scones is that they can be in your mouth just about half an hour after you think “hey, scones!”, usually without any need to run to the store, even if you had no plans to bake. These are light and mapley and, on top of everything else, will make your kitchen smell wonderful. 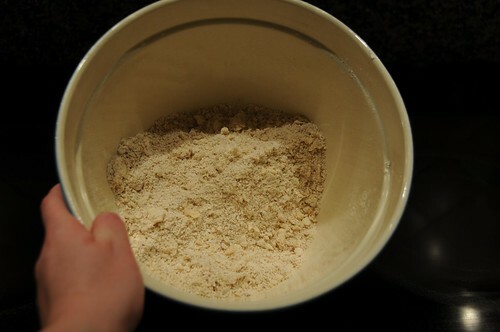 Stir together the flours, baking powder, baking soda, 1/4 c. brown sugar, and salt with a fork in a large bowl. Cut in the butter. This means you can plop the whole stick into the dry ingredients, and then, using two butter knives, the tines of a fork, or even a pastry cutter, break it up into little pieces. Once I get it into rough chunks, I usually start using my hands, rubbing the butter between my fingers until it’s thin, then throwing it back into the flour mix to get coated. (In fact, this process is also sometimes called “rubbing in the butter,” I assume for this very reason.) 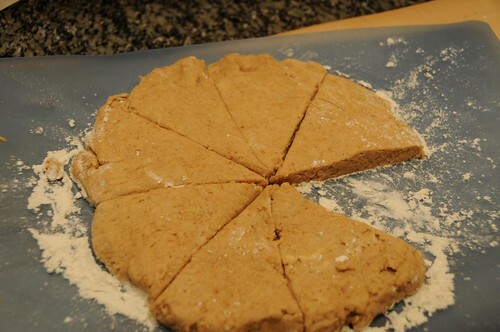 You’re aiming for the texture of damp sand — fairly uniform, although a few bigger chunks won’t ruin anything in scones. Once you’ve achieved this, you can pour in the maple syrup and mix. Add half the milk, then add the rest a bit at a time as needed until it it forms a dough. Pat the dough out on a lightly-floured surface until it’s about 3/4 of an inch thick. 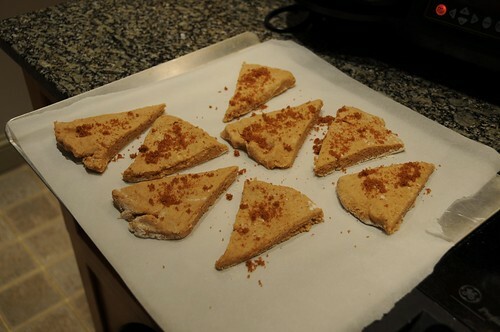 Cut it into eight wedges using a sharp knife (I like my paring knife for this), and put them on the baking sheet. If you’re used to baking with white flour, watch extra carefully, as the whole wheat flour makes the dough tan enough to throw off your game. They’ll sound hollow when you tap on the bottom. Oh my, this looks lovely! I think I know what I’ll be making for breakfast one morning this week! I just stumbled upon your blog, and I’m really enjoying it!